Mealworms are not the most demanding of creatures, so setting up a suitable habitat requires nothing in the way of special or expensive equipment. Chances are that you already have everything you need, and if you don’t, the dollar store probably will. Add about 3 or 4 inches of wheat bran to a plastic box or a small fish tank. This is both bedding and a source of food. You may mix the bran with meal or flour. Add some pieces of fresh fruit or vegetables as food and to supply moisture. To economize, use the waste parts, such as apple cores and potato peelings. Add the beetles or larvae (“worms”) to the tank. The more you have, the faster a mealworm farm will get going. 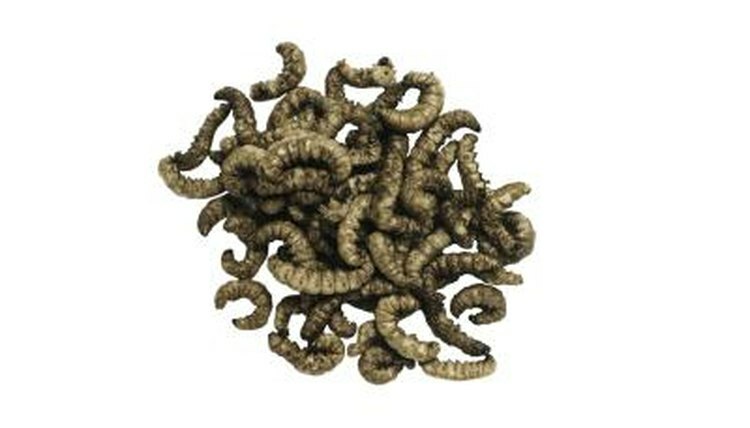 For example, 1,000 larvae would get a 10-gallon tank off to a good start. Secure a piece of cheesecloth over the tank with a large elastic band. This is not to keep the mealworms in -- they can’t climb -- but to keep other insects, such as flies, out. Place the habitat in a warm room. If you live somewhere with a mild climate, you can keep it in an unused garage or garden shed. Replace the vegetables every couple of days or immediately if you notice rot or mold. Add more bran to the top once the level begins to drop, which probably won’t be necessary more than about once every few months.  Because you are not adding water, you can reuse fish tanks that have sprung leaks as mealworm houses.  It shouldn’t be necessary to change the bedding often, but if the bran becomes moldy, remove the moldy part and add a little fresh bran.  If you want to use meal or flour as well as or instead of bran, mix it with a few crumpled strips of newspaper. This stops it becoming a solid block through compaction, according to the University of Kentucky College of Agriculture. ⚠ The mealworms probably won’t be able to climb out, but other animals can climb in. If you are raising mealworms somewhere with rodents, use a wire mesh cover instead of cheesecloth. Mealworms look like a tasty snack to rats and mice, who can chew through cloth in seconds. ⚠ Mealworm Store notes that mealworms sold as “extra-large” or “giant” have probably been given hormones so that they won’t pupate. Although pets might like to eat them, they can’t mature and so they won’t breed.